On Christmas morning last year, as my youngest sister passed out the gifts heaped under my dad’s tree, she struggled with the big box wrapped in shiny paper and marked with my name. She lugged it across the room, plopped (the very, very heavy) box in my lap and went back to her job as Santa’s helper. I opened the package to find a beautiful new Dutch oven, a thoughtful and practical gift from my dad, who knows I love few things more than spending Sunday afternoons in the kitchen. Over the next few days, as I cleaned up from the holidays and got my kitchen back into neat working order, I pondered what recipe to try first in my new Dutch oven, which replaces a cheaper version that I’d used for little but soup. I found my answer in “Cook It In Your Dutch Oven,” a new offering from America’s Test Kitchen that goes far beyond basic soups. 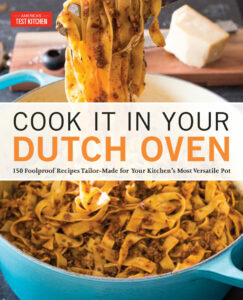 The book promises 150 “foolproof recipes” that are tailor-made for the versatile Dutch oven. The recipes are divided into eight sections: one-pot dinners, classic soups, hearty stews and chilis, roasts and braises, foolproof frying, simple sides, bakery-style breads, and desserts. The frying section, while interesting, likely won’t get much use at my house. But with the coldest months of winter upon us, I’m sure the soup and roast sections will get a fair amount of attention. I’m already looking forward to trying the West African Sweet Potato and Peanut Soup and the Sichuan Braised Chicken Leg Quarters with Shiitake Mushrooms. To round out the recipes, “Cook It In Your Dutch Oven” includes an introduction to using the pots, a rating of 11 Dutch ovens (my 7.5-quart Lodge porcelain enamel on cast iron Dutch oven rates “good” for both cooking and durability), and – perhaps most helpful of all – tips on how to clean the pans. As I sat on the couch one night flipping through the book and marking recipes to try, my husband noticed the Classic Beef Stew. The recipe, about as straight-forward as it gets for beef stew, sounded solid and I happily made it for him on a brutally cold Sunday afternoon. The stew was great – tender beef, vegetables that weren’t overcooked – and, as it simmered in the oven for hours, brought welcome warmth and coziness into my kitchen. But it was the Eggplant with Garlic and Basil that caught my eye every time I opened the book. I haven’t cooked much with eggplant, but the description of “why this recipe works” (included with each recipe) alleviated any nervousness about soggy eggplant. The recipe works, according to America’s Test Kitchen, because the Dutch oven’s heat draws away moisture and allows the eggplant to brown at the same time. 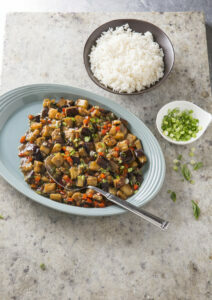 The eggplant recipe is listed in the “Simple Sides” section, but I made it into a meal by serving it with rice. I forgot to include the red pepper flakes, but the dish was near-perfection even without them. I’ll add this recipe to my regular rotation. 1. For the sauce: Whisk all ingredients together in a bowl. 2. For the vegetables: Combine 1 tablespoon of oil, and the garlic and ginger in a bowl; set aside. Heat 3 tablespoons oil in Dutch oven over medium-high heat until shimmering. Add half of eggplant and half of bell peppers and cook, stirring often and scraping bottom of pan to loosen any browned bits, until tender, about 12 minutes; transfer to separate bowl. Repeat with remaining 3 tablespoons oil, eggplant and bell pepper; transfer to bowl. 3. Scrape away any remaining brown bits from now-empty pot. Return cooked vegetables to pot and push aside. Add garlic mixture to center and cook over medium-high heat until fragrant, about 1 minute. Stir garlic mixture into vegetables. Whisk sauce to recombine, then add to pot. Cook, stirring constantly, until sauce is thickened, about 1 minute. Off heat, stir in basil and scallions. Serve.